At Google I/O, Google announed Google Web Elements, a set of widgets that allow users to quickly integrate some of Google’s most popular products (e.g. Calendar, Maps, News) directly into their sites with a minimal amount of effort. Above is a News element (widget), searching for news on Sports. At the same event, Google VP of Engineering Vic Gundotra talked in his keynote about HTML 5. You can find more about this keynote and HTML 5 features here, with several links to tutorials from the Opera, Mozilla, Palm, and Google teams working on HTML 5. Interesting stuff! A photo with my dear friend Zhaohui Wang after the successful defense of his diploma thesis yesterday. 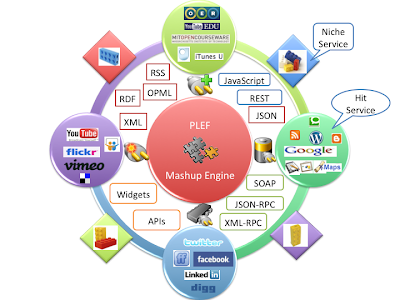 I enjoyed the great discussions we had around the topic of mashup personal learning environments. Will write more about this in later posts. A video of Larry Page delivering the commencement address at the University of Michigan. Which Ajax framework should I use? After working with the various frameworks, we believe that all the frameworks were very good and could be used to write applications with. We're using GWT here and GWT-Ext here, and I highly recommend them for core Java developers.